I'm Dr. Mathew Mutinda, a Kenya Wildlife Service mobile vet, formerly based out of the Lewa Wildlife Conservancy (www.lewa.org) in northern Kenya. Working from the back of a Landcruiser, often in the middle of nowhere, I treat wildlife injured from poaching and human-wildlife conflict. In the course of my career, I've carried out hundreds of interventions, including translocations of wildlife to new areas as well as disease research. My job is not without challenges - we aren't always able to save an animal. Luckily, for one terrible story, there are many positive ones. I often get asked about my experiences, so I've decided to do this AMA. Thank you for doing this AMA, and thank you for dedicating your career to helping animals. In the US, we don't typically feel responsible for this despite us feeling sad for the animals. We blame countries like China for keeping the Ivory market alive, for example. Aside from donation of money, what can the common person in the United States do to help your cause? Do you see any poaching that is being catered towards an American audience? If so, what can we do to stop that? Support organizations fighting poaching and the ivory and rhino horn trade. Contact elected officials to make sure your government votes at CITES for an international ban on ivory and rhino horn. Urge your members of Congress to support programs like the USAID Biodiversity Program, the Multinational Species Conservation Fund, combating wildlife trafficking programs at USAID and the U.S. State Department, and the Global Environment Facility. Contact your embassy in high ivory demand countries to take a stand against the ivory trade. Don’t buy ivory and rhino horn. Contact companies that are transporting wildlife goods (such as "trophies") and tell them to stop. Additionally, you can also practice conservation where you are, as we are all connected across the planet, and the loss of biodiversity is happening everywhere. I just saw that sad story about the whale that died with 40kgs of plastic and waste in its stomach. I think we must all strive to find sustainable ways to live - minimise and preferably eliminate plastic use and straws, support ethical businesses, support local organisations that promote environmental protection, practise a minimalist lifestyle etc. Have you every dealt with an angry hippo? Not being sarcastic, I've just found them fascinating since I was a child. Yes I have immobilised hippos before, and just like most animals, they do get agitated and angry at human interventions :) But we always do what is welfare-friendly and treat the animal with the respect it deserves. I remember receiving a call a few years ago on a Sunday morning that a hippo had walked into the compound of the American embassy in Nairobi, and we had to go and get it. It was complex trying to move it as hippos are heavy and strong animals, and they have very sharp canine teeth. They're tough in every way. Luckily, we managed to move it to a big dam within the Nairobi National Park. Hello Doctor Mutinda, thank you for doing this AMA. How do you find the animals that need your assistance? Do you receive calls from locals and other teams, and/or do you and staff search the usual poaching and human-animal encounter injury areas to see if you come across creatures that need your help? I saw on the website that there is a domain awareness system. Is this what alerts you to the injured animals? Also, have you ever encountered a poacher as he was trying hunt and kill endangered animals, and how did you deal with the situation? We have teams that patrol wildlife areas, and they are quick to alert us in the case that an animal is sick or injured. Additionally, the general public, those who live alongside wildlife or neighbouring wildlife areas are also our eyes and ears on the ground. Conservation organisations in northern Kenya are also connected via various communications platforms such as the Domain Awareness System (DAS) and we get alerts whenever an animal is injured. We mobilise resources as quickly as possible and ensure we attend to the animal as soon as possible. Our anti-poaching team will sometimes encounter poachers who are part of large cartels. There are legal ways of dealing with poachers - they are arrested by the Kenya police and taken into custody, then later, court. Luckily, our wildlife laws in Kenya are very strict and if one is caught with ivory or rhino horn, they are heavily fined and jailed for at least 20 years. Many thanks for your excellent questions! It is always inspiring to know that there are many other people around the world who are also passionate about protecting wildlife. Please join Lewa's mailing list to stay up-to-date on our work: https://www.lewa.org/subscribe/. I also encourage you to follow Lewa on social media, where we often post videos, photos and stories about veterinary interventions as well as other aspects of our work. I am currently a pre-vet student studying Wildlife Biology and hoping to somehow combine my love of conservation with vet med. Most everyone around me wants to work with companion animals or in the clinic, but working in the field and possibly in conservation/research really excites me! What kind paved your path to this profession and what were some challenges you have had? I became interested in animals growing up in my village where people tended livestock. I noticed that the death of cattle was often devastating to the families who depended on them for their income and this is what sparked my interest in wanting to treat animals. I went to vet school in Kenya and completed a 6 year course. After graduating, you're required to do an internship with a wildlife entity, and in my case, I was lucky to get an internship with the Kenya Wildlife Service. After 2 years, I was sent to Lewa. At Lewa, there was so much work to be done and I learned a lot on the job. Daily work with wildlife is the best training. My job has not been without challenges. The animals I treat are extremely dangerous. For example, in one harrowing case, there was a pregnant rhino that had been shot by poachers, then left to bleed to death with her intestines hanging out. The rhino struggled to fight for her life. It was devastating. We felt so helpless as there wasn’t much we could do to save it. Best of luck in your career path! What are the most common problems you have encountered with African wild dogs aka painted wolves and does LEWA currently have a pack? Wild dogs have recently been plagued by disease. Two years ago, wild dogs in the Laikipia-northern Kenya ecosystem (where we are based) were attacked by canine distemper which killed a huge percentage of the population. Canine distemper is dangerous because it affects all carnivores, and it's often domestic dogs that are the carriers of the disease, which wildlife has no immunity for. Yes, I heard about this wipe-out. but did not realise it covered the same area. Devastating for everyone who was monitoring those packs. What is your personal opinion on the effectiveness of the vaccination programmes undertaken in various parts of Africa? Do you see any chance of them getting on top of the problem? My opinion is that if the vaccination programmes are designed in a sound, scientific manner and based on good epidemiology, they have the capacity to curb disease in both domestic and wild animal populations. Lewa occasionally hosts a pack of wild dogs - they are migratory animals that move across a vast landscape. The most common problems for the dogs is diseases such as canine distemper, injury after being caught in snares/traps, human-wildlife conflict and loss of habitat. Have you seen any outbreaks of disease like canine distemper or rabies in the Conservancy? Do you have vaccination programs for wild and/or domestic dogs in the area? Wild dogs are sometimes plagued by diseases. Two years ago, wild dogs in the Laikipia-northern Kenya ecosystem (where we are based) were attacked by canine distemper which killed a large population of the endangered wild dogs. Canine distemper is dangerous because it affects all carnivores, and it's often that domestic dogs are the carriers of the disease, which wildlife has no immunity for. Have you or your colleagues ever gone on undercover operations under the pretense of being a foreign buyer? If yes, what was it like? 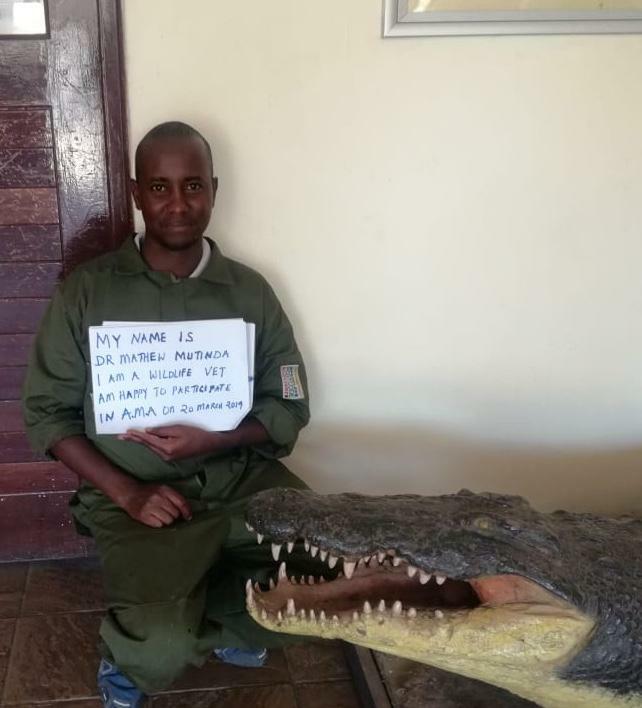 On the other hand, I've heard that some poachers seek to injure anti-poaching rangers. How much of a threat are they to your daily activities? Thank you for appreciating our work! In Kenya, we partner with intelligence agencies to unmask poaching cartels at both the national and international level. The Lewa anti-poaching team works closely with the government and security agencies to always be ahead of the poachers, who have become increasingly sophisticated in their operations. Our anti-poaching teams across the country do face threats daily, but we continue to be brave enough to do what we must to protect wildlife. What is your favorite animal to work with? What is your least favorite? I like the black rhino - they are very feisty and have evolved for millions of years, which makes their anatomy very interesting to me as a vet. They are often unpredictable but incredibly resilient. I have translocated close to 100 black rhinos to new sanctuaries to create breeding populations, and most have done really well. Giraffes, though elegant, are tremendously difficult to immobilise. They have long legs which can kick you to death, and a long neck which is difficult to manage when they are darted. It's very challenging to treat a giraffe, but we always do our best. Treating an elephant is also hugely challenging. Being the largest land mammal, weighing about 6-7 tonnes, when immobilised their abdominal organs can exert pressure on their lungs, making them to lack oxygen. We therefore have to be careful in how we position them, and always ensure that their trunk is always 'open' during any operation, using a small tube. Elephants tend to also be very family orientated, and if you're treating a calf, expect a battle from the mother and aunties! I've read in a NatGeo articles and other news sources that controlled sport hunting can actually be beneficial to conservation efforts because it brings in money that can be used to maintain animal populations. Do you think this is true? Hunting in Kenya was banned in 1977, so we have no examples to compare with here in our country. I, personally, do not support big game hunting. Culturally, most of us in East Africa don't understand the need to kill an animal if it's not necessary for sustenance. The economics of sport hunting are complex, and some African countries have adopted that model, but not here in Kenya. Have you found that the numbers of animals have increased or decreased since the ban on trophy hunting? The number of elephants have increased since the ban on trophy hunting in Kenya but there are also other factors that have contributed to the increased population since the ban in 1977. These include joint efforts by the government (through the Kenya Wildlife Service), conservation organisations, the Kenyan public living alongside wildlife and better anti-poaching and security interventions. Through a multi-pronged approach, we can protect endangered species and see their populations increase. I follow several wildlife rescuers on social media, and it seems like they always have a few animals in the local population that they've named and recognize. Are there any "regulars" in your area that you see often? Yes! For example, at Lewa we have regular rhinos that we've named. There are certain routes you can take where you will encounter animal "friends." Any links for named painted dogs? Do you consider big game hunting and poaching one in the same? Does the money spent on big game hunting really benefit anything/anyone? Big game hunting was outlawed in Kenya in 1977, so our country has not practised hunting since then. Hunting in the early 20th century decimated thousands of elephants and rhinos in East Africa, and as a result hunting was responsible for putting some of the animals on the endangered list. Hunting also takes animals out of the ecosystem, such as mature bull rhinos and elephants, killing off some of the best genes from a species. I'm not an advocate of hunting, I believe that we can practice conservation of animals without killing them. Big game hunting, in the countries where it happens, is legal, while poaching remains a criminal activity. Having watched a few videos of medical intervention for giraffes - I take my hat off to anyone even contemplating it! What is the minimum number of people you need when darting a giraffe? Presumably, it is something that is planned in advance along the lines of a military campaign? It is indeed like a military campaign with precision and clinical execution needed to achieve success! The long legs, long neck and high blood pressure make it extremely difficult. It requires at least 6 people to conduct treatment on a giraffe. Please see the YouTube video above for a giraffe intervention in action. I'm impressed you guys used an electric saw to take off the ring. I guess there is no other way to do it, but I could barely watch the video, I thought it was going to cut her/his skin! Thank you! Sadly, there was no other way - we didn't have much time and with giraffes, you have to be so careful because of their unique anatomy. As a mobile vet, you don't have the luxury of sophisticated equipment, and you have to make do with what you have at the moment. You can see how tense we were in the video, and so relieved after it all went well! I love animals but am a bit trapped in London over here. How would u recommended practice for becoming a vet or animal career? Thank you for your question! Be diligent in your studies - especially in biology class. Volunteer your free time at animal shelters, vet clinics and your local zoo to help you determine if this is the career for you. You can also try to intern in wildlife areas in Africa and see how it is to practice it in the field. Best of luck and please do reach out if you need more info. Glad to hear your opinion on the topic of saving an animal rather than let nature take its course. Considering that humans are constantly making catastrophic permanent interventions in the life of billions of animals, it seems silly to even question the ethics of saving one animal here and there ( general observation here - I assume person asking earlier question was asking rhetorically). Anytime there is a report of an injured animal on the Kruger park site, half the comments are opposing the other half who say Kruger should intervene. Have you ever had to argue the case with onlookers whilst treating an animal? Do you get opposition from locals or tourists? Luckily, most people - the Kenyan public, Lewa employees, tourists etc - have never argued the case against an intervention. It's baffling to imagine that intervening to save an endangered animal, should even be a cause for debate. What we don't do is interfere in natural dynamics, such as predator-prey interactions (say for example, a lion hunting a zebra, as it needs it for sustenance). Makes sense to me :) What about non-endangered species though? No other animal in sight, just a lone injured young impala for example? Do you have a standard policy for a case like that? Non-intervention/treatment or does it depend on other considerations like cost factor for example? We often judge case by case. For example, if the impala (an abundant species) is injured from a possible hunt by a predator (lion looking for supper! ), then we cannot interfere as the predator also needs to eat. However, if the animal is injured as a result of other factors, such as a snare, and is in anguish, it is my duty as a veterinarian to practice basic animal welfare, so I would intervene. Wildlife in need - animals in suffering etc. Hi Dr. Mutinda! How can you tell if a conservancy/wildlife reserve is responsible and worthy of support? To learn more about a conservancy, it is important to look at management structures and if they have clearly defined outputs in place. The focus should be on conservation programs that are geared toward creating positive outcomes for 1) wildlife, 2) people and 3) the environment and larger ecosystem. For example, Lewa Wildlife Conservancy employs a community-centric conservation model that recognises conservation can only be successful if it benefits both people and wildlife. As a result, the Conservancy invests equally in both conservation and livelihood programmes in education, healthcare, water, micro-enterprise and more. This ensures that conservation becomes participatory and beneficial to all, and therefore, longterm and sustainable. The real question is are you rocking a 70 Series or 200 Series Cruiser? A 70 Series, HZJ79, but looking to upgrade! Hi there, I am currently about to begin my training in veterinary medicine and surgery. I volunteer ever year on a reserve in South Africa, working with White Rhino. How would I be able to work/ gain experience with someone like yourself, both as a student, and when Im qualified, please? My programme often offers internship to both Kenyan and international students, but not at the moment, otherwise I'd have been pleased to receive your application! I would highly recommend finding local wildlife vets in your area (there should be many in South Africa) and requesting for internship experience. Be in the field as much as possible to learn first hand. Additionally, find as many resources as possible to keep you up to date with the advancements in the wildlife veterinarian field, such as sites that publish papers and scientific journals regularly. Thank you for all of the amazing work that you do! I am curious, are there any community-based conservation programs where you are, specifically regarding alternative livelihoods? Do you feel they are successful in both alleviating poverty and protecting wildlife? Sorry that this is a bit unrelated, but I am very curious! Are elephants naturally hostile towards humans? Not at all. Most wild animals prefer to stay away from humans. The only time an elephant or most wild animals attack humans is if they feel threatened, if you catch them by surprise, or especially when they have a young one that they feel is under threat. Hello Dr Mutinda, I saw earlier you mentioned you don’t interfere with predator prey situations. What if a prey animal was attacked by a predator but was not eaten, for example a lion attacking and injuring an antelope but getting distracted by something else and leaving the antelope without eating it, would you then attempt to save it or would letting it die be nature’s course? If we find the animal and it's in obvious agony, we'll do what we can to help. Often, however, predators often follow through with their hunts, as they need it for sustenance. What has been your favorite rescue? There was once we rescued a rhino calf, barely months old, whose mother was a victim of poaching. It was very difficult to move the calf that was in obvious distress and shock, refusing to be isolated from its dead mother, but we managed to. We took the calf to an orphanage where it was very well looked after. It's now healthy and thriving. The calf was named Solio and I often follow up on its progress. It makes me so proud to know that Solio will live to adulthood because of our work. have there ever been times where you’ve been unable to save an animal? what happens next? Yes there have been times when we've been unable to save the animal, and needless to say, it's usually devastating. One harrowing case I recall is of a pregnant rhino that had been shot by poachers in a Conservancy about 3 hours from Lewa, then left to bleed to death with her intestines and calf hanging out. The rhino struggled to fight for her life. It was devastating. We felt so helpless as there wasn’t much we could do to save it. Luckily, for one terrible story, there are many positive ones. When we're unable to save an animal, we have to notify the Kenya Wildlife Service team about the death, and offer a report on what happened. Secondly, if it's an animal with a trophy that is in demand from illegal wildlife traders, such as rhino horn or ivory, we remove these from the animal, and submit them to the Kenya Wildlife Service where they are safely locked away to ensure they don't end up in the black market to fuel the illegal wildlife trade. Hello Dr Mutinda, Thank you for what you do. Question : How do you keep your self secured? Do you have a security team? Im referring safety against poachers you encounter or have you encountered one? They might get hostile towards you. Thank you and keep safe! Hi, thanks for this question. Firstly, most poachers attack at night while we operate during the day. Secondly, we always ensure that an area is safe before we immobilise and treat an animal. For example, if I assess a situation and realise it might be dangerous for me and my team, I'll always request to have the Anti-Poaching team to accompany us to ensure our safety. I haven't encountered poachers during my operations (thankfully) but we always put safety first. Your job seems super rad. How did you get into doing this? Thank you! I love my job! Growing up, most families in my home area kept livestock. I noticed that the death of cattle was often devastating to the families who depended on them for their income and this is what sparked my interest in wanting to treat animals. Being a vet has been the most fulfilling decision of his life. For the longest time, I was the only one in the Laikipia and northern Kenya region, and as a result, I've directly participated in saving hundreds of wildlife. There is a big debate out there right about big game trophy hunting being a positive thing for African wildlife, as the cost is so high that it usually funds parks and conservation efforts. Some will pay up to hundreds of thousands of dollars to kill a bull, which is said to save hundreds of other animals. How do you feel about this? Is it true? Have you seen the money from big game trophy hunting go directly into conservation? I'm having a hard time believing that killing any animal, especially endangered, is ever a good thing. Hunting was banned in Kenya in 1977, and as a result, we have no way as a country to measure the impact that it has or can have on endangered species conservation. Different African countries employ different conservation models in the protection of their wildlife, and in Kenya, we decided that trophy hunting wasn't the path we would take. At Lewa, the conservation model is structured in such a way to ensure that conservation is a platform to benefit both people and wildlife. As a result, alongside conservation and anti-poaching programmes, we also run numerous development efforts in education, healthcare, water, micro-enterprise and more. In this way, we ensure that people who live next to wildlife derive their day to day livelihoods from conservation and directly participate and benefit from it. Do you have internships???? This sounds so amazing! I regularly offer internship opportunities to students of veterinary medicine (both Kenyan and international) but not at the moment, as I'm working from the Kenya Wildlife Service headquarters. You can register to receive our news here - https://www.lewa.org/subscribe/ and email me at [[email protected]](mailto:[email protected]) if you're a student of veterinary medicine, and I'll let you know when an opportunity comes up. Wildlife rescues can be controversial. Some conservationists may be of the opinion that if animal is injured it is best to let nature take its course. In the course of your work, what are some of the considerations you make before treating or rescuing an animal? Our first consideration is to check the status of the species - is it endangered or not? If endangered or threatened, such as the black rhino, Grevy's zebra, wild dogs, mountain bongo, lion etc, we have to intervene. Their numbers are so few that we cannot afford to lose even a single animal if it can be saved. Each individual remains vital in saving that species. Secondly, some of the injuries found on animals are not caused by natural occurrences such as predator-prey dynamics, rather by human activities such as poaching, snaring and human-wildlife conflict. We intervene to make things better for the animals, and also ensure that we are reducing the negative impact of human activities.